Ari's In Wonderland: Queen Odelia: Skin care fit for a queen? Queen Odelia: Skin care fit for a queen? I noticed that if you go back a few pages on my blog, I've mostly been writing about skin care. That's probably because I've been taking my skin care even more seriously than I have been for the past few years. It's at the point where actual science plays a big part in what I choose to regularly put on my face on a daily basis and I've made a mental note to talk more about that in a future blog post! For now, and still on the same topic, I'm going to talk about a skin care brand I was recently introduced to called Queen Odelia that hails all the way from Israel! Long story short, while I was still in Tokyo, I was contacted and asked if I wanted to try some products from a leading Israeli skin care brand. I've never tried any product from there before and I was intrigued, so of course I said yes! Some weeks later, my Queen Odelia package arrived containing three products: an Eye Cream, Facial Serum, and Hand Cream. The story behind the brand is fascinating! Apparently the founders were inspired by a flower referred to as 'Queen of the Night'. For an entire year it lays dormant in the desert and looks very much like a dead, cactus plant. But for only one night during the summer solstice, the fragrant flower blooms beautifully then disappears again by morning. According to their website, the founders "...set out to create a brand that replicates the hopeful spark that the desert flower and other fruits like it give." They also go on to say that all their (cream) products contain what is known as Prickly Pear Seed Oil which is combined with natural salts found in the arid deserts surrounding the Dead Sea. This makes it extremely rich in minerals, Aloe Vera, and antioxidants. Making this their 'power ingredient' comes as no surprise, especially when you learn that it's a secret skin ingredient which has been passed down for generations between Nomadic women to help them fend of the harsh and damaging conditions of the desert. Now that the interesting back story is out of the way, let's get to the reviews! 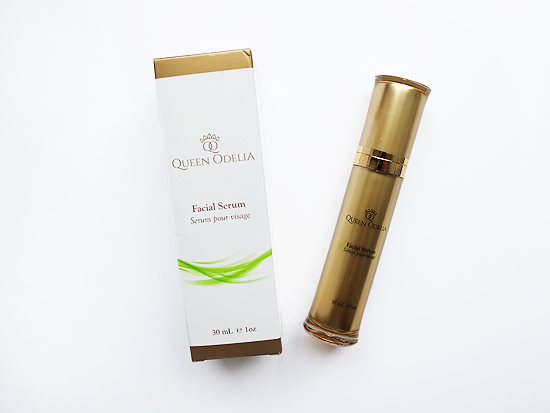 The first product I'll be shining the spotlight on is the Queen Odelia Facial Serum ($60.00/30ml). I'm a sucker for a good facial serum, especially the kinds that promote hydration, anti-aging, acne prevention, or ones that promise to refine skin AKA making it smoother and more supple. Queen Odelia says, "The Queen Odelia facial serum’s highly concentrated active ingredients target the deep-set causes of premature aging. It provides the skin with important nutrients and lubrication that will give your skin a naturally youthful quality." That already ticks two boxes for me - anti-aging and skin refinement! 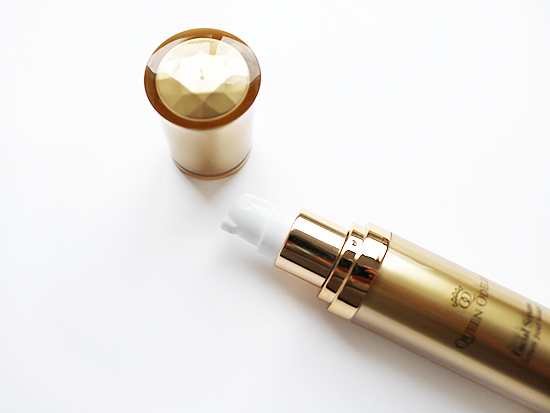 True to the brand's theme of luxe skin care, its sleek, gold packaging seems to radiate elegance and refinement. The serum, I'm happy to report, is dispensed via a practical pump that easily dispenses just the right amount, and is contained inside this entirely gold hued and slim bottle. When I first saw the serum on their website, I thought the bottle was made of glass, instead it's a durable plastic. The only qualm I have with the bottle is that the pop-off cap doesn't fit securely and it very easily comes off. Not sure if mine is just faulty or if they're all like that. Naturally the brand suggests using the serum along with one of their moisturizers, so either their Day Cream | Protective Shield and/or Night Cream | Nocturnal Nourishment. They claim that merely applying the serum is not enough to 'strengthen' the skin, but they do add that using a moisturizing day or night cream, not necessarily their own, to compliment the serum can improve its performance. This applies to serums and creams or other moisturizers in general though, that's why it's important to choose products that work well together. The serum itself is very lightweight and absorbs quickly into the skin. In fact, I can already feel it absorbing as I'm still spreading the rest of it all over my face. 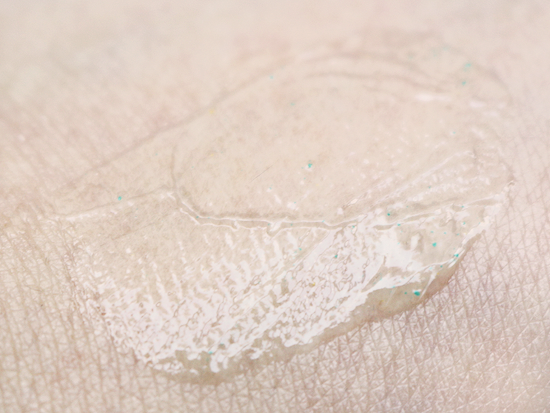 Unlike some other serums, its absorbency makes it perfect for anyone who only has limited time to dedicate to skin care in the mornings, or if you're applying it in a hot and humid environment. 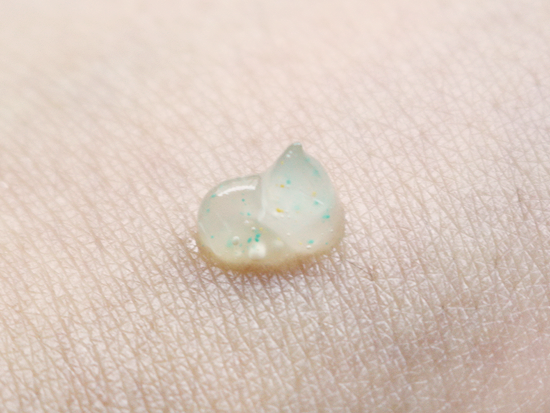 It's very easy to spread on and around the face too and doesn't promote oiliness. I find it doesn't help add enough hydration or moisture to my skin though, so this would probably suit normal to oily skin types, not drier ones. While there was a slight increase in moisture, according to my skin analyzer, it was only around 5%. The most noticeable effect the serum had was it did make my skin feel a little bit smoother, which is most likely the Prickly Pear Seed Oil in it doing its thing as the company claims it (the oil) is 'easily absorbed to leave the face soft and smooth with no oily traces'. Aside from all that, I have to say that the serum unfortunately made my skin break out. Thankfully it was very mild, but it's still not a good sign to find at least 2-3 fresh, red bumps every time the day after using the serum. I punched the ingredients through CosDNA and found out that an ingredient in it, Ascorbyl Palmitate, which is actually an antioxidant, has a rating of 2 (out of 5) on the Comedogenic scale meaning it has a low but still possible risk of causing acne. Of course I can't be entirely sure, but it could very well be the culprit here. I've uploaded the entire ingredient list here for you to check on CosDNA. Due of the reaction, I stopped using the serum after almost a week. 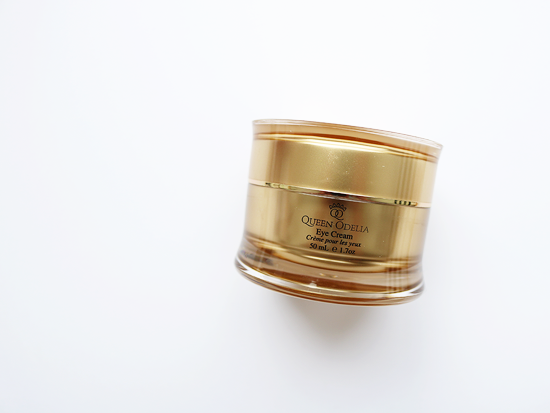 Next up is the Queen Odelia Eye Cream | Delicate Age Defier ($55.00/50ml). Since my under eyes are naturally quite dry, meaning they're also more prone to fine lines, eye creams are a must for me in my skin care regime. 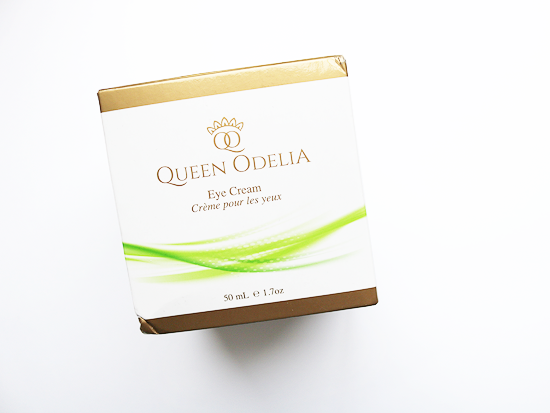 Queen Odelia says this eye cream was "...specifically created to treat the sensitive skin surrounding the eye. The age-defying cream has the ability to smooth over dark circles and reduce wrinkles." Thanks to my nasal allergies, my entire eye area is dark as well, so this already sounds like it'll be able to solve all my eye problems. First of all, can I just say that the tub the eye cream comes in is huge. Well...huge for an eye cream, at least! The fact that it holds a whole 50ml was already surprising to me. For a product which you only apply on a small area of your face, this tub will last you a looong while, even if you're regularly generous with your application like I am. I would say the slightly steep price tag can easily be justified thanks to the size alone! Anyway, the tub, just like the serum, is housed in an entirely gold-colored, plastic container with a twist-off top. There is a second, soft, plastic cover on the inside for added 'leak' or spillage protection. The eye cream is supposed to increase the natural elasticity in the eyelids and counteract loss of firmness in the soft creases. According to Queen Odelia, it's also been clinically proven to ensure eyes 'look fresher and brighter everyday, even on days that you do not catch a wink of sleep at night'. The brand says their dermatologists recommend dabbing the eye cream on one's lids every day. Why they don't mention the under eye area is lost on me, but naturally, I apply there also twice a day (morning and evening). They even claim that the oil in the cream will 'maximize the vibrance of your natural eye color and make your eyes shine'. Honestly, those sounded like some pretty outlandish claims to me, but I like to give everything a chance! The eye cream is definitely on the slightly thicker side, but it actually doesn't take that long to absorb fully into the skin and it still is surprisingly, quite lightweight. Already I knew this would prove to be more moisturizing and hydrating compared to the serum, and I was right! When I first put it to the test, and prior to applying the cream, my under eye area had a Moist level of 18%. After the cream was fully absorbed, I used my skin analyzer again and it had jumped to around 41%. That's a huge difference! My entire eye area also feels a lot smoother and softer immediately after. Prickly Pear Seed Oil is also present in this, so maybe that's the secret! Or maybe it's also because they've tossed in some good moisturizers and emollients in there, such as Aloe and Jojoba extract. Though the cream doesn't fully prevent certain concealers and the like from bringing out or emphasizing any dry patches under my eyes, it does make applying and blending in the concealers easier thanks to the smoother texture of my skin. I also don't see a reduction in the fine lines under my eyes, but I'll attribute that mostly to my eyes always having been prone to lines even at a young age, as well as perhaps needing to use the cream longer. At the very least, thanks to its ability to really soften and moisturize, I'm certain it can help stave off any more from showing up for a long time! As per usual, I highly recommend going through the ingredient list I put up here on CosDNA so you can check what ingredients may cause any problems for you. 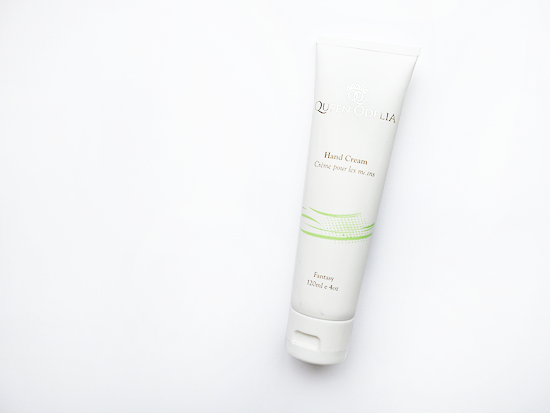 Last but not least, it's the Queen Odelia Hand Cream | Extreme Moisturizer ($18.00/120ml). As I've become older, everything on my body seems to have gotten drier, including my hands. In particular, around my nail beds. I do use cuticle oil, but I'm not fond of putting it on before bed as I don't like any kind of oily substance coming in contact with my sheets, so the hand cream seems to be an equally great (if not better) bed time alternative. Queen Odelia says the "...all-natural hand cream is easily absorbed into the skin leaving no oily traces, and can be applied as often as needed. Its antioxidant activity was uniquely developed to fade age spots, tighten loose skin, and soothe dryness. The cream also protects the skin from free radicals, exposure to damaging chemicals, and the extreme temperature changes." The lotion, this time around, is packaged in a simple but still elegantly designed white tube with a matte finish. Filled with 120ml of product, I find it's just the right size for travel or placing on your night stand, but at the same time will last you quite a while, especially if your hands aren't as dry as mine. True to its claim, the lotion doesn't leave an oily or greasy finish and absorbs quickly compared to a lot of lotions I've tried in the past. That's why I was never motivated to use hand cream before, because they always took forever to absorb and usually left a greasy film on my hands after. Now I don't have age spots or loose skin (yet), so I can't say if it'll help them fade away, but it does indeed soothe dryness to just the right degree. That good ol' Prickly Pear Seed oil is at once again, along with Jojoba and Aloe extracts, leaving me with smoother and softer hands after just one application. I also rub a little extra around my cuticles and it keeps the roughness and dry flakes of skin at bay. They say hands are one of the quickest to show signs of aging, so I'm glad I finally found a hand cream that I really like! It has quite a nice, perfume-y scent too, which I'm more than fine with. Thankfully it's not overpowering and fades gradually after some time. For the CosDNA ingredient list, click here. Cruelty-free. Queen Odelia does not test on animals. Lovely and elegant looking packaging. Though they're also durable, the serum's cap was faulty and does not stay on securely. Has a pump which dispenses proper amounts and is easy to control. 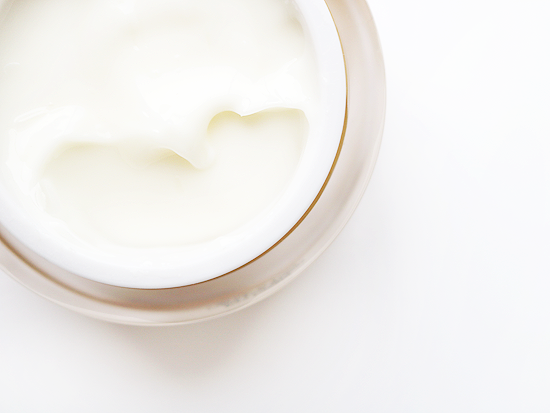 Best for those with dry to oily skin, not hydrating or moisturizing enough for drier skin types. Makes my skin feel a little smoother and softer, but also made me break out after using. A little thick, but still lightweight. 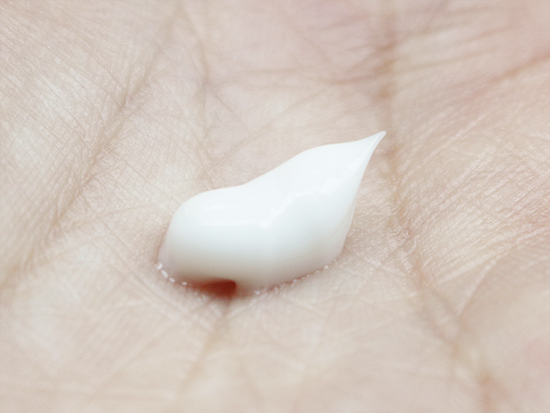 During one test, skin moisture level under my eyes jumped from 18% prior to applying to 41%. My eye area immediately feels soft and smooth after applying. Comes in a slightly big tub that holds 50ml worth of product. Does not leave a greasy or oily film after using. Helps keep my hands soft and eliminates roughness.